Zerodour Fridge Deodoriser inserts are easy-peasy to use. To take full advantage of their odour-trapping capabilities, simply remove the sides of the cute little pyramid package along the perforations and place in your fridge. Voila! No funky scent of Brie! Zerodour zaps unpleasant odours immediately and keeps working 24/7 for sixty sweet smelling days. Now… you can have your Brie and not smell it at all. That stinky wedge of Brie tastes delicious but it doesn't smell great while it's hanging out in your fridge next to the bottle of Bordeaux. What to do? 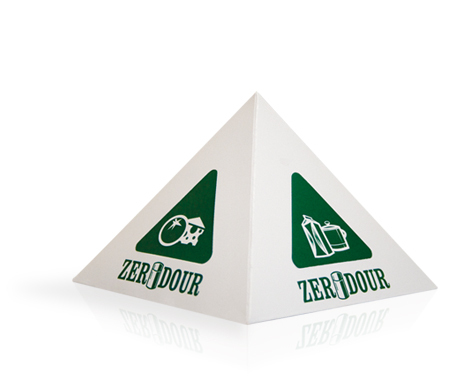 Get Zerodour Fridge Deodoriser so you can open your fridge without having to hold your nose! Zerodour Fridge Deodoriser zaps strong odours with Zeolite, a natural bacteria-drawing mineral that was discovered way back in 1756. Today, Zeolite poses a huge threat to all of those wimpy refrigerator fresheners that simply mask foul refrigerator smells instead of eliminating them naturally and completely. 100% natural and biodegradable. Draws odour-causing bacteria into its core, locking it inside. Zerodour Fridge Deodoriser inserts are easy-peasy to use. To take full advantage of their odour-trapping capabilities, simply remove the sides of the cute little pyramid package along the perforations and place in your fridge.